Acclaimed indie developer Team Meat has brought its beloved platforming mascot Meat Boy to the tabletop space for the first time in the CCG Super Meat Boy: Rival Rush. Super Meat Boy: Rival Rush is a one versus one nonstop fast paced no holds barred finger blistering every card for themselves showdown where only the swiftest and smartest survive. 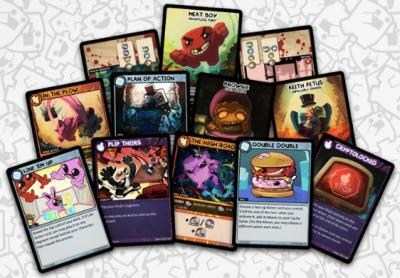 It will include cards for all your favorite Meat Boy characters, like Dr. Fetus, Bandage Girl, and of course, Meat Boy himself. Look out for some new characters too! COMIC CON GERMANY gibt neue Stargäste bekannt.